Please refer to our stock # 1925 when inquiring. 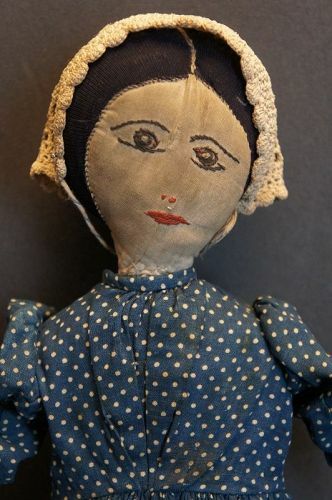 This all handsewn doll has a fine embroidered face, stockinette hair with bun in the back and has a quiet beauty about her. She is 18" tall but is small in stature, (head and body are delicate). She is firmly stuffed with cotton, she does sit but bends at the waist. She is wearing a camisole and a blue and white polka dot dress both are in keeping with her age but not original and a crocheted antique bonnet. She is circa 1880-90.